The highlights of day two – Sunday. I went to more spaces than I did on Saturday, but I often got so wrapped up in conversations that I forgot to take pictures again. Sorry. Gili Levy, 119 Ingraham Street. 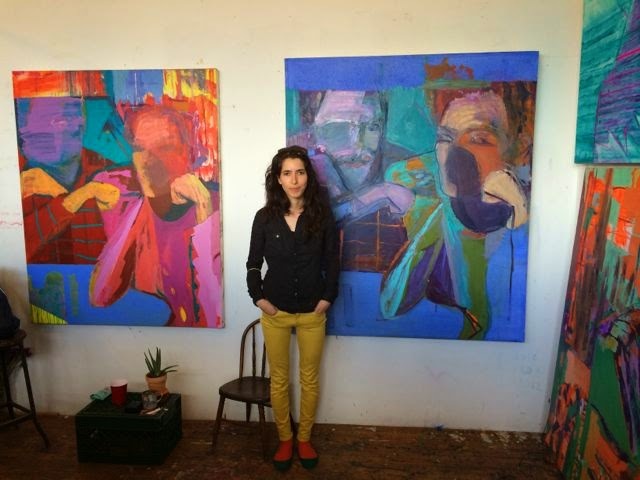 Gili Levy told me a well-known painter advised her to stop working on the blue/green painting because it was finished. Artists usually hate that, but in this case Levy was open to it, and I think it was for the best. The blue areas left on the outer part of the painting push the images forward and allow the painting to breathe more. Bushwick Daily's sage advice columnist and artist (she recently had a sharp-witted exhibition at Auxiliary Projects), Dr. Lisa Levy SP (self-proclaimed), sat in front of 56 Bogart acknowledging people for whatever they wanted recognition for. Last year she posed as a granny sitting in a rocking chair and offered to let people sit in her lap and be comforted; I tried it, and, to my surprise, I felt comforted! Sorry no photo. Real on Rock Street, Rock Street between Bogart Street and Morgan Avenue. The colorful styrene foam sculpture in front is Half a Dozen Macaroons, 2013, by Daisuke Kiyamiya. Real on Rock Street, a twelve-artist sculpture exhibition, was installed on a one-block private street owned by Frank Brunckhorst Company, a Boar's Head distributor. 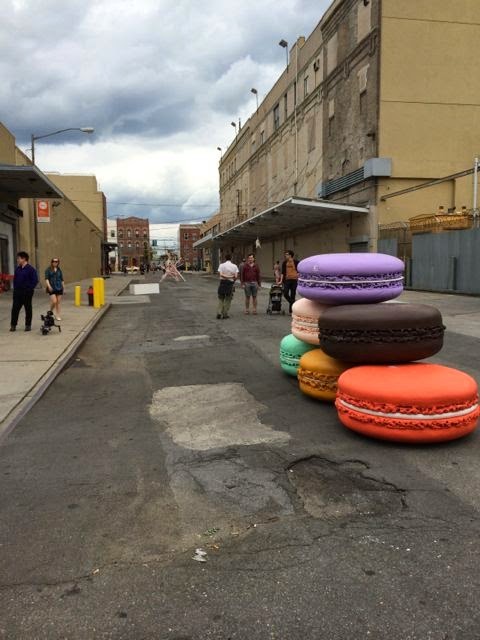 Last year and this they opened the street to the public for a sculpture exhibition curated by Bushwick artist/gallerist Deborah Brown (Storefront Ten Eyck) and LES gallerist Lesley Heller. Henry Sanchez, English Kills Project, Chico's Laundromat, 996 Flushing Avenue. 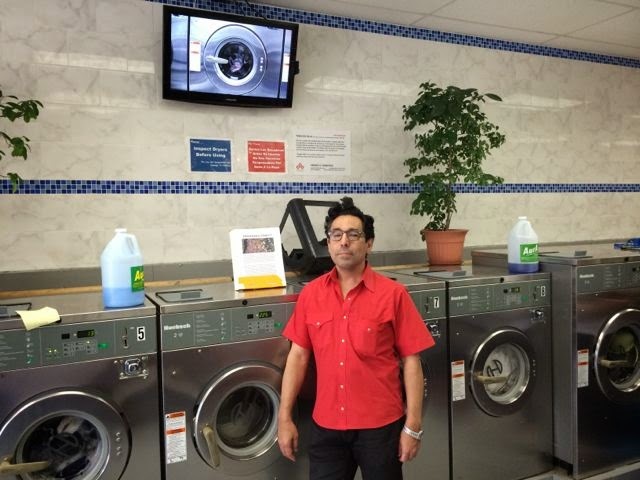 For the second year, former (and sorely missed) Jersey City artist Henry Sanchez screened his videos in this laundromat. This year the work was particularly relevant to Bushwick – and poignant. The video is a semi-documentary about English Kills, a hidden (by high fences and buildings) and very polluted waterway in the northwestern part of the BOS tour area (part of English Kills is across the street from 195 Morgan). The refreshingly well-made video shows the beauty and heartbreaking contamination of English Kills in all seasons. You can see the 12 minute video here. Secret Project Robot, 389 Melrose Avenue. Over the past few years I've tried visiting Secret Project Robot about six times, and they've always been closed when they were supposed to be open. 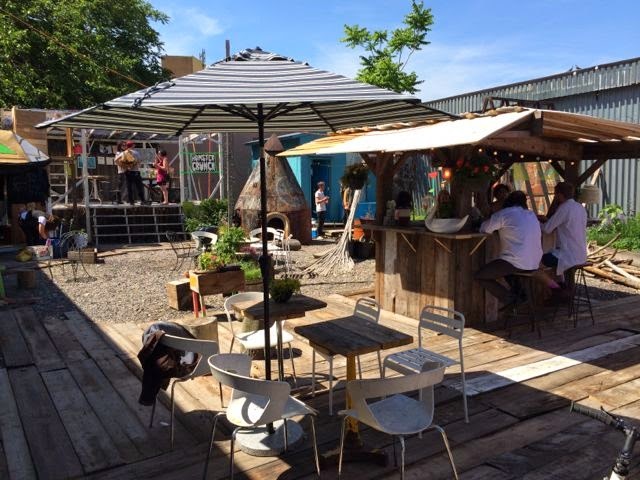 But they were open for BOS, and I'm glad I finally got to see their sprawling space and their large, high-fenced garden that they decked out like a Renaissance Faire for BOS. 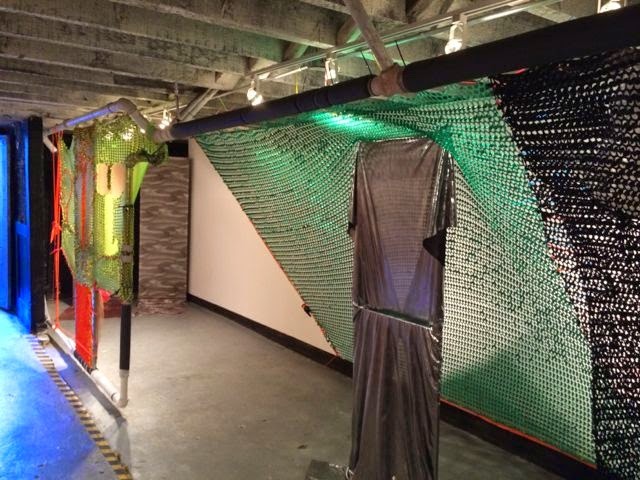 Site-specific installation by Leeza Meksin, Airplane Gallery, 70 Jefferson Street. Airplane's basement gallery was bisected by layers of gorgeous fabrics, many of them nets, that viewers were encouraged to touch. I've seen a lot of art related to clothing over the years, but the sensitive arrangement of contrasting materials, the beauty of the colors and the tactility of the fabrics made this show different, more dramatic. 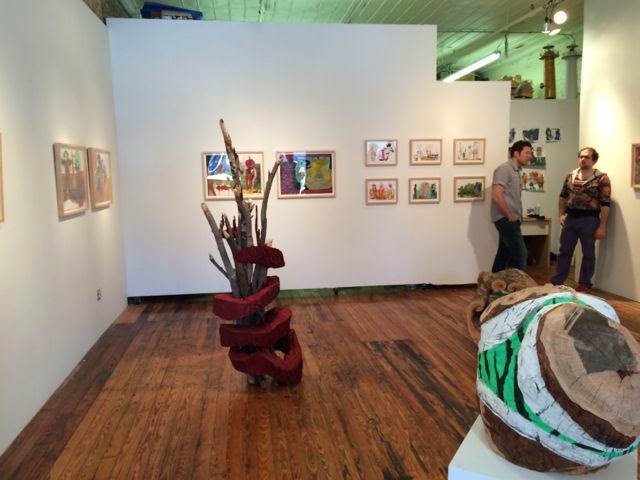 Sculpture by Brent Owens and paintings by Ben Coode-Adams, Wayfarers Gallery, 1109 Dekalb Avenue. Brent Owens's trompe-l'oeil wood sculptures and reliefs were a hit when he showed them on Beat Nite at the English Kills Gallery, and this work, at the Wayfarers Gallery, was equally convincing. Meryl Meisler, A Tale of Two Cities: Disco Era Bushwick, Black Box Gallery, 12 Jefferson Street. Ahh, the bad old days! 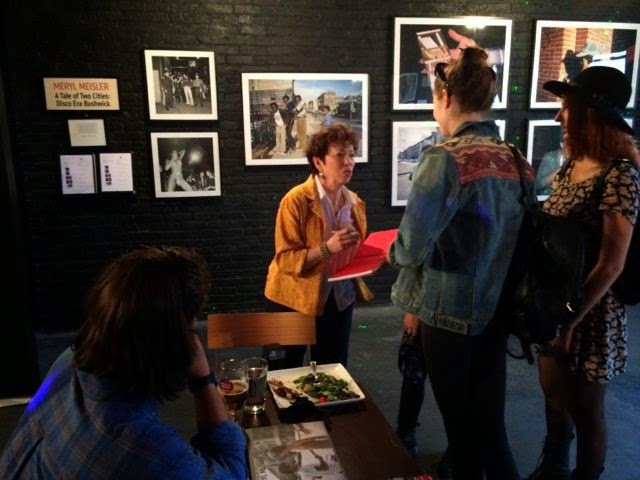 Meryl Meisler captures seventies and early eighties Bushwick and Manhattan in this exhibition and in the accompanying book (which I bought – it was also a book launch). Meisler is justly admired and beloved by artists in Bushwick in good part because she's been there photographing the scene since 1981 – that is, since before many of them were born. Vincent Romaniello, 513 Johnson Avenue. 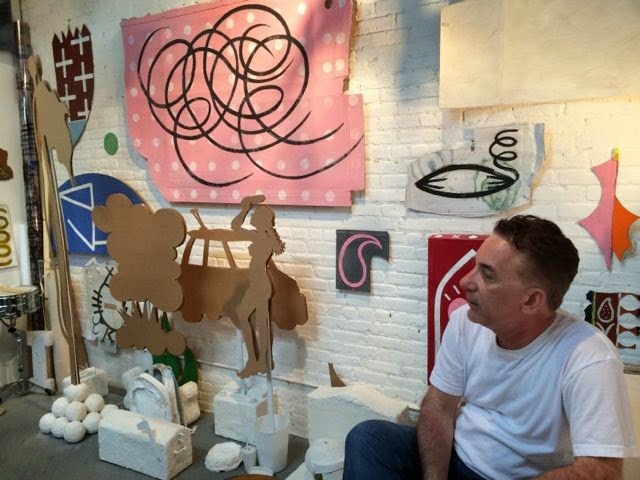 I saw one of Vincent Romaniello's paintings at Centotto Gallery Saturday and was so impressed by the economy of means and casual rawness of his painting that I went by his studio. Romaniello's work is deceptively offhand and simple. It takes masterful painting ability to turn lines in space, activate the negative space, create a sense of light and airiness, and fill a contour with energy, as the outside shape of his paintings do so well. 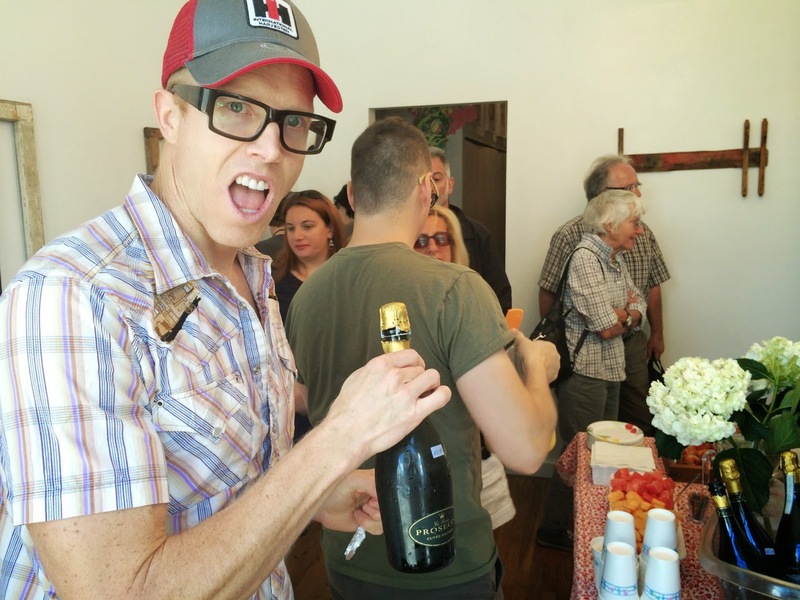 AND the work is joyously playful. I also saw excellent shows at Microscope and Outlet Galleries. I forgot to take photos, but you can see some on their websites. Microscope, 4 Charles Place, had Soap, a 16 mm film by Bushwick artist Matt Town about the building of a soapbox car and test-driving it through Town's neighborhood. It doesn't sound like much, but there was something about the roof-top filming and other shots that made the film compelling throughout. The show also had an installation that included the soapbox car, transformed into a projection booth that played the film. I'm really sorry I didn't get a photo of Alan Kleinberg's photography show, Out All Night at Outlet Gallery because it went so well with Meryl Meisler's work. Both photographers document the seventies New York downtown scene, Kleinberg's a bit heavier on the art scene. BTW, on June 6th, Outlet, in collaboration with Norte Maar, is opening what promises to be a impressive show: Arshile Gorky and a selection of contemporary drawings.